Since 1981, Trans-Clean Corporation has been providing on site mobile fleet washing services for numerous local and national truck fleet operators. At Trans-Clean, we pride ourselves on being the best the industry has to offer when it comes to the on site cleaning of vehicle fleets. Our turnkey system and state of the art technology allow us to guarantee our customers that their vehicle fleets will be cleaned and looking their best in a timely, effective and environmentally safe manner. The versatility of our system allows us to clean any size vehicle or piece of equipment anywhere. With the increased presence of environmental monitoring of Connecticut's' and New York’s waters, by Federal, State, and local authorities, vehicle wash water runoff, if not contained and collected, will run into nearby storm drains, and then into nearby streams contaminating our water. 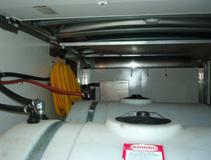 At Trans-Clean we have the solution to protect our environment from vehicle wash water run off. *Section 22a-430 of the Connecticut General Statutes requires that no person may initiate a discharge to the waters of the state without first obtaining a permit. Therefore, anyone who initiate’s such a discharge must apply for a permit. The state will not allow permits for untreated discharges of cleaning wastewater to surface streams, the ground surface, or storm drains. Should you currently be employing such a method of disposal you should immediately terminate your activities and find an alternative, acceptable means of disposal. Should we determine that any person is practicing such disposal methods we will institute appropriate legal actions for fines and /or imprisonment. See our complete Connecticut State Statutes information page here. 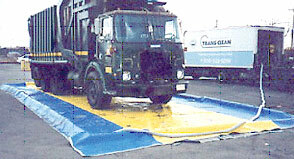 The wash mat system is a polyester reinforced, vinyl-coated mat that vehicles drive on to containing the wash water. Our drive on burms keep the wash water safely on the mat for containment and collection The wash mat system is used for irregular or unimproved surfaces such as dirt, gravel or unimproved parking lots to protect the property from ground water contamination. This method enables us to have Trans-Clean personnel drive our customers vehicles on to the wash mat and provide a professional cleaning right at the customer’s facility. 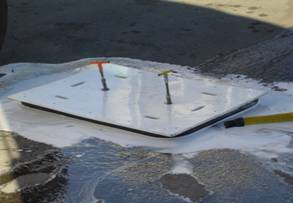 Drain blocker system is a temporary cover that is placed over the storm drains in the parking lot to prevent vehicle wash water from entering during vehicle the washing. Our exclusive TEE™ handle locking system firmly secures the cover on the storm drain and pulls the cover down tight with a reinforced spring loaded locking mechanism. This method saves customers from moving the vehicles and usually lets them be washed right in their parking spots. Trans-Clean collects vehicle wash water through our truck-mounted system that was designed specifically for our mobile wash industry. The vacuum will pick up twenty gallons per minute continuously, which is more than four times what a pressure wash system will put out. Safe, dependable and proven technology to protect the environment and your property. As the wash water accumulates it is constantly being reclaimed with our custom truck mounted MobilewashVac vacuum system. It is then stored in our truck mounted holding tanks for transportation to our state permitted and licensed facility for legal disposal as required by Federal and State law. Our New York and Connecticut permits # (CT-130) for transportation and # (CT-GVW000343) allow for discharge to our permitted facility. The wash water is then treated and sent to our local POTW for final treatment and discharge. Learn about Connecticut Statutes regarding Connecticut Washwater Disposal Laws here.